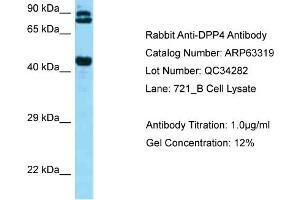 Characteristics This is a rabbit polyclonal antibody against DPP4. It was validated on Western Blot. Background The protein encoded by this gene is identical to adenosine deaminase complexing protein-2, and to the T-cell activation antigen CD26. It is an intrinsic membrane glycoprotein and a serine exopeptidase that cleaves X-proline dipeptides from the N-terminus of polypeptides.